Seamus McGuigan recently celebrated his retirement with family and friends in the Canal Court Hotel. Seamus retired from the Jobs & Benefits Office in Armagh, having worked in the Civil Service for 23 years. 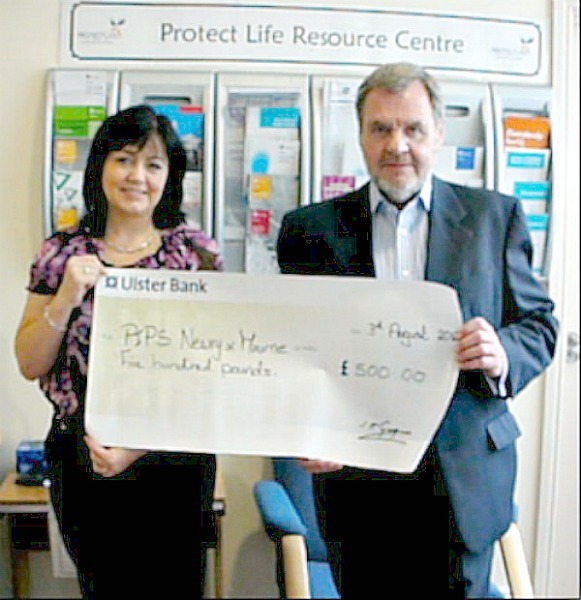 Seamus kindly requested donations to PIPS Newry & Mourne in lieu of presents and presented Dympna Maguire with a cheque for £500. PIPS Newry & Mourne would like to sincerely thank Seamus for making the donation and Seamus would like to express his gratitude to his family, friends and work colleagues for their generosity.